Simply by making an entirely social decision and sticking to it, Andrew Jackson’s First Lady Emily Donelson, niece of his late wife, managed to impact the political climate of his presidency and come into open conflict with him. In fact, were it not for Emily Donelson’s status in the presidential household and the rigid obstinacy of her decision, the famous “Peggy Eaton Affair” would have never occurred. 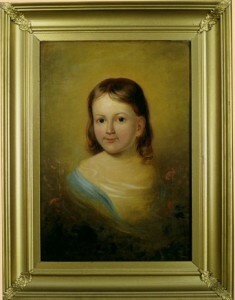 Rachel Jackson, one of her portraits in the collection of the Hermitage. 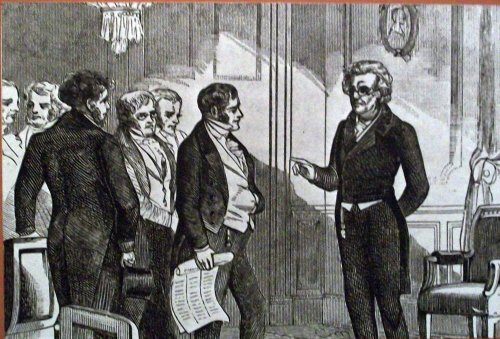 Although the President’s wife Rachel Jackson had died less than three months before her husband’s presidency began, she had made definitive plans about how she would carry out her role in the White House. Anticipating the arrangements later made by Letitia Tyler, Peggy Taylor and Eliza Johnson, all presidential spouses from the southern states, Mrs. Jackson intended to have her young, well-educated and socially sophisticated relative – in her case, niece Emily Donelson – appear in public and assume the visibility of hostess at social events where guests were strangers to her. Many people know the details of the tragic romance between Andrew Jackson and his wife Rachel, who had believed that she was legitimately divorced from her first husband Lewis Robards at the time she married Jackson, her second husband. Not until she and Jackson had established a household together did they discover she was technically a bigamist, her divorce papers never having been processed. This error, be it a matter of innocence or negligence, was nevertheless judged with harsh morality and Rachel was labeled a “wanton woman” and her bigamy used by Andrew Jackson’s political opponents as a poor reflection on his own character. 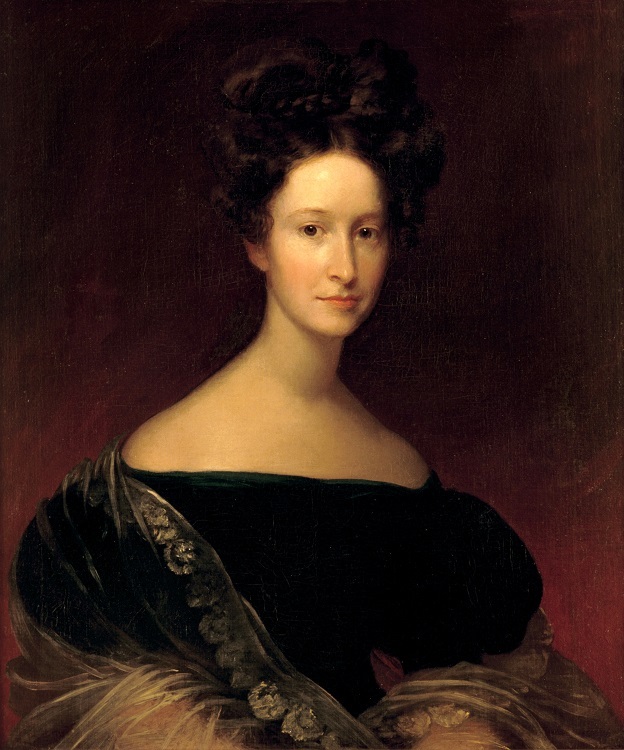 So emotionally pained was Mrs. Jackson that she seems to have intended to limit her public interactions which might expose her to the keener ridicule by which Washington society has always been known, and which she declared to be vain and irreligious. Her heart condition also made long receiving lines difficult for her to breath. The new President formally designated Emily Donelson as his White House hostess, something no previous chief executive had done. 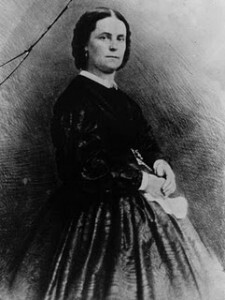 At only twenty-one years old, Emily Donelson was one of the youngest women to serve as First Lady. 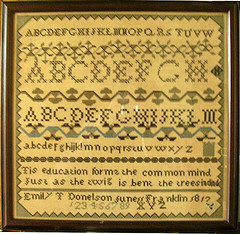 The daughter of Rachel Jackson’s brother John and born in a town which was named with her own family name, Emily Donelson had the opportunity to pursue a sophisticated education, graduating from the Nashville Female Academy. Unlike that of her aunt, she became an expert in grammar and had an elegant handwriting. When she was seventeen years old, Emily married her first cousin “A.J.” (named for Andrew Jackson), the son of Rachel Jackson’s brother William. Since A.J. was raised as a son by Andrew and Rachel Jackson (but never formally adopted) Emily was truly like a daughter to the President-elect and his wife. A West Point graduate and lawyer, A.J. 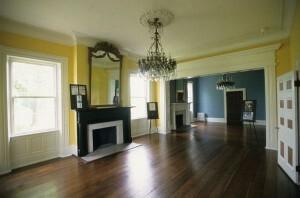 Donelson would come to work in the White House as the President’s Private Secretary. Despite her youth, however, Emily Donelson was already familiar with the White House, having been entertained there by the President and Mrs. Monroe in the winter of 1924-1825, and had also been a guest of Secretary of State John Quincy Adams and his wife Louisa in their home. Managing her loyalty to Andrew Jackson while befriending his hated political rival John Quincy Adams would prove to be a remarkable feat for the then-eighteen year old woman. It was a trait that served her well in the White House. 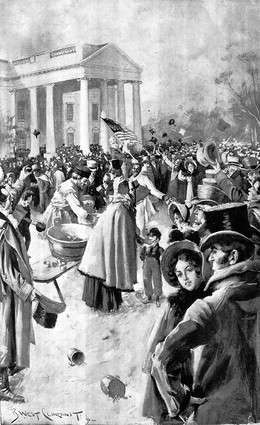 The mob scene outside the White House on Jackson’s 1829 Inauguration Day. In fact, this young First Lady, who dazzled crowds by appearing in an amber-colored gown at her uncle’s inauguration would befriend both past and future White House residents. She came to know Martha Jefferson Randolph, Martin Van Buren and James Polk, the latter two serving as godfathers to two of her four children born in the White House. Initially, due to a period of mourning for her late aunt, there was no great entertaining in the Jackson White House but from the moment the social events began there was trouble with Peggy Eaton, wife of the President’s Secretary of War and a close friend to Jackson. 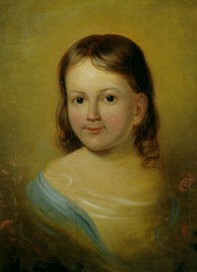 Mrs. Eaton had first met a young Emily Donelson during the 1824-1825 social season in Washington, when the former joined the Jacksons and stayed as guests in the boardinghouse run by Peggy’s father. At the time, Peggy was married to a captain who was then away at sea and his absence apparently gave her license to behave flirtatiously with many other men. Despite this both Andrew and Rachel Jackson approved of Peggy and were happy when she, later widowed, married John Eaton. 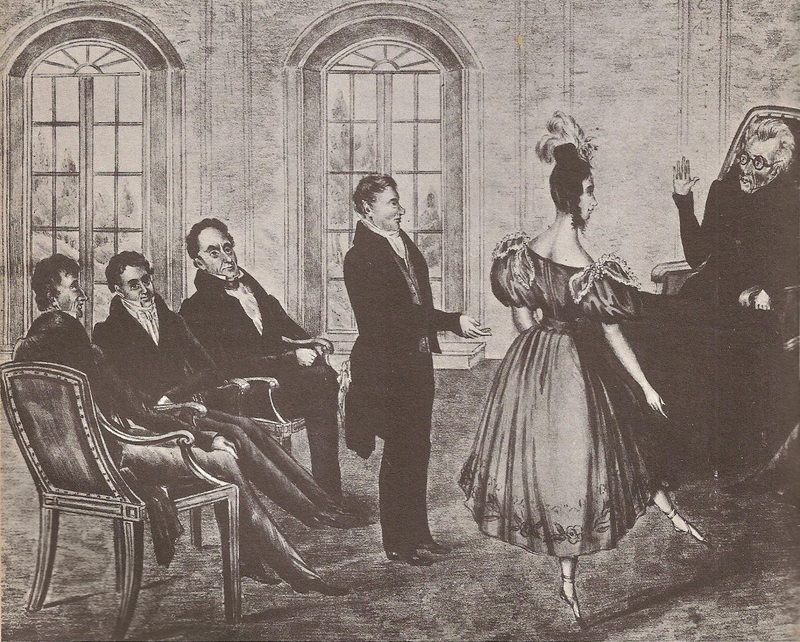 Emily Donelson, however, refused to consider the Cabinet wife deserving of social respect. She joined the other socially prominent women who were married to Cabinet members and refused to accept invitations from Mrs. Eaton or to acknowledge her at parties or even treat her with any politeness. Emily received an angry letter of rebuke from the War Secretary. 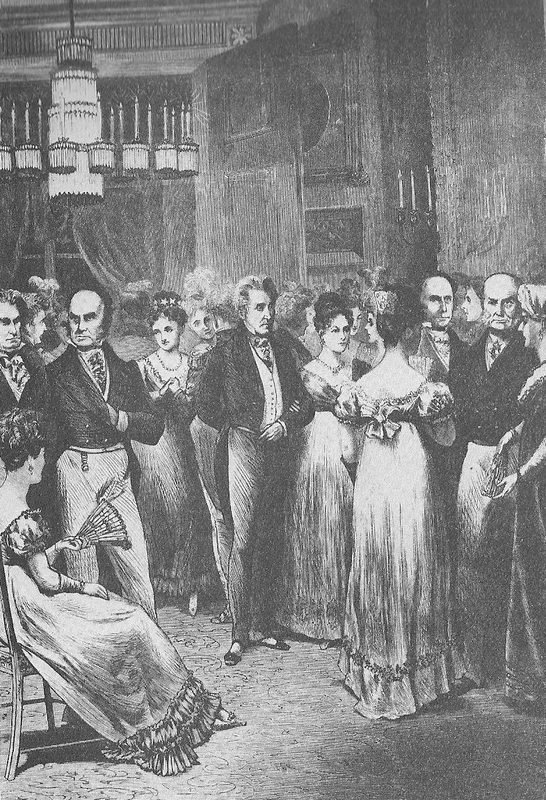 He correctly pointed out that the social ostracizing his wife was experiencing was how Rachel Jackson had been treated, due to her previously being a bigamist. Emily responded by defending her aunt and never mentioning Peggy. Then Secretary of State Martin Van Buren tried, telling Emily she was being influenced by the older Cabinet wives. In response, when Van Buren held a dinner for the Cabinet and their spouses, Emily and the other women refused to attend. Only Peggy came. 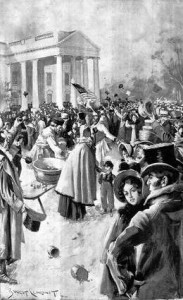 It was no insignificant social matter by 1830, when President Jackson learned that the wives of diplomatic representatives of foreign countries were now considering a boycott of the American Cabinet wife. President Jackson was furious with his niece. When she returned with her husband to Tennessee that summer, the President did not want encourage her to return to the White House unless she relented. She refused to. Furthermore, she also refused to stay at his Nashville estate, retreating to her Tulip Grove plantation instead. Jackson wrote that “there being no lady of the House, there was something wanting,” but Emily refused to apologize or acquiesce to his wishes. 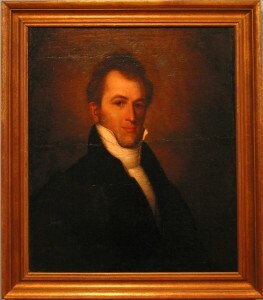 He took the actions of Emily Donelson and also the wives of his Cabinet members as an act of political insubordination. 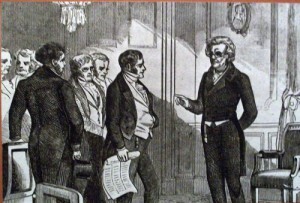 President Jackson meeting with his Cabinet. The “Peggy Eaton Affair” ultimately was a factor in his firing his entire Cabinet and replacing them with more loyal members. Not until a year later, when John and Peggy Eaton moved to Spain where he served as U.S. Ambassador there did the matter resolve. 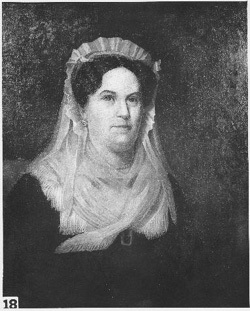 In the fall of 1831, Emily Donelson returned to the White House as First Lady but weakened by tuberculosis she returned home and died there four months before the end of the Jackson Administration in 1837. What I find most remarkable here is that Emily, niece of the much maligned bigamist Rachel, and married to her own first cousin, himself a nephew if the same maligned Rachel, would have the nerve to take such a moral high road vis a vis the merely flirtatious Peggy–coming so many generations later, as I do, I’m having a hard time following the various taboos and penalties for flouting them! Today, I think, it would be Emily who might be looked slightly askance at, for being poor Rachel’s niece and for marrying her own first cousin, while Peggy would be the decidedly sought after belle of the ball. At least the latter sounds like better company to me! Dear Mark – Please forgive the delay of a month a half in responding – the problem is that so much of the “good” incoming comments are flooded by the overwhelming number of spam ones. I would have to agree with you about the hypocrisy of Emily Donelson. It is odd considering how close she was to Rachel Jackson. Again, sorry for the delayed response.